The last time I climbed the steep hill to Waterbury's Best Western Plus hotel, it was out of both hunger and curiosity. I had never been inside the hotel's Wandering Moose Café — nor did I know anyone who had. Once there, I ended up drinking a very good vodka martini and leaving without eating more than bar snacks. Neither the ambience nor the menu inspired me to splurge on dinner. Apparently, I was not alone. "We have this very quaint little restaurant, but it never seemed to get enough 'oomph' behind it," said hotel general manager Melissa Moore earlier this year. She was explaining why she tapped her friend, chef Robert Barral, to reinvent the hotel's dining options. Even though Barral already owns and runs one restaurant — Brandon's Café Provence — he took the bait. Barral lived in Waterbury when he was executive chef at the New England Culinary Institute. With 10 years at Café Provence under his belt, he was primed for a new challenge — and creating a culinary destination inside a two-star hotel is certainly that. So the Wandering Moose closed this past winter, and the 62-seat restaurant underwent an identity change. In mid-March, it reopened as Café Provence on Blush Hill. Though chef Barral's name arcs over the restaurant's logo wherever it appears — after all, he's a well-known figure in the Vermont restaurant scene — it's actually chef Ittai Azoulay, Barral's former Brandon sous chef, who runs this kitchen. Despite a face-lift, the décor retains vestiges of its predecessor. Maroon (napkins, booths) and gold (tablecloths, pendant lights) still dominate the color scheme. The lights are dimmer, but the vibe evokes the late 1990s — soft jazz plays, for instance, and a table near the entrance is decorated with a frozen-in-time plated dessert and some knickknacks. Three weeks into Café Provence's life, the bar still had the feel of a work-in-progress. During my first visit, one side of the bisected bar held only two empty wine glasses and a bottle of Patrón tequila. A week later, a few more bottles of spirits had taken their place. But cocktails don't seem to be a focus here, even though hotel guests sometimes hit the bar simply to drink. Business travelers and contractors, weary families with toddlers, hungry locals and curious foodies — all of them show up in a hotel restaurant at one time or another. This diversity surely made menu planning a balancing act. Café Provence ended up with a patchwork of French classics — most of them duplicates of dishes at the Brandon restaurant — and American stalwarts. There's duck confit and steak au poivre, for instance, but also pizzas and a grass-fed beef burger. The kitchen seems sweet on invertebrates: snails, scallops, shrimp, mussels — a roster familiar to anyone who has frequented the Brandon spot. If I were a regular there, I'd probably be disappointed to learn there are few new dishes to sample on Blush Hill. But since this was my first Café Provence experience, I was keen to dive in, even if the chain-hotel version doesn't appear to be aiming for a culinary grand slam. On my first visit, I chose to eat at the bar, which hosted a freewheeling and convivial crew, as I'd anticipated. When I ordered the last portion of that day's special — braised veal short ribs — a pair of beer-sipping regulars erupted in frustration. One of them told me he stays at the hotel whenever he's in town; he waxed rapturous about the ribs, which he had tried a few days earlier. We eventually made a deal: I traded some short ribs for a slice of the gentlemen's shared pizza, a house pie topped with sour cream, bacon, red onions and wilted spinach. Plenty of other dialed-in dishes pushed the unpleasant short ribs from my memory. The Napoleon of Escargot Provençale was a tumble of plump, garlicky snails and creamy tomatoes spilling from between triangular clouds of puff pastry. Ricotta cavatelli melted on the tongue, especially after I dragged them through the puddle of citrusy beurre blanc with which the pasta came. At $10.95, the cavatelli is the restaurant's most expensive appetizer but worth the price — especially as it's laced with a haunting wisp of truffle oil. Entrées range in price from $13 (for the burger) to $25 and do not skimp on volume. Café Provence's seafood stew is a hallmark dish, and hefty: a coral-hued hillock of mussels, scallops and shrimp in an herbaceous tomato-laced broth good enough to drink. A heap of luscious saffron risotto rose from the stew like a fragrant island, and tiny toasts — slathered with basil butter — offered textural counterpunch to the pillowy seafood. It was garrigue-meets-the-sea, or something like that, though the flavors could probably be kicked up a notch. The Duck Duo was simpler, but the dish similarly weaves together a tapestry of flavors, most of them earth-bound. An herb-heavy, lusty navy-bean stew contained the flotsam of shredded duck confit, diced eggplant and tomatoes, crisp asparagus spears, and baby carrots. On top rested sliced, succulent duck breast — cooked perfectly medium-rare, as I ordered, with its skin still crisp despite the steam from the stew beneath. The wine list is lengthy and thoughtful, drawing heavily on French bottles — including a few from a Languedoc vineyard owned by a relative of Barral's. The private-label Café Provence Chardonnay and Rouge (a blend of Rhône varietals) are both easy sippers, but the dry rosé is the brightest of the bunch. Quenching and summery, with ripe strawberry and candy notes, it's a versatile wine that can pair with escargot or duck, and even with a few of the desserts. That dessert menu is succinct: ice cream, crème brûlée, cake, a sample platter. But those we tried were excellent, if not particularly nuanced. A massive — and massively rich — molten chocolate "bomb" was adorned with delicate crème anglaise, a golf-ball-size scoop of ice cream and spikes of raspberry coulis. By contrast, a lavender crème brûlée had a caramelized crust so thick, it could be eaten on its own like candy. Underneath lay velvety, floral cream — perfect. Dinner for two, with tax and tip, will top $100, a price that pushes Café Provence into the fine-dining category — without fine-dining ambience. Service is professional and prompt, though on my visits the servers seemed to be still learning the menu. And though the culinary technique is top-notch, I found some flavors too dull. 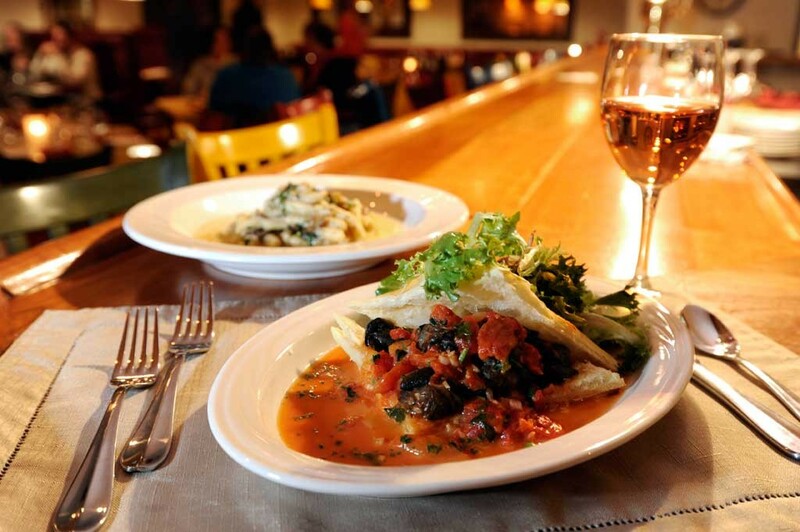 This is not a place for foodies in search of culinary adventure or a romantic dinner, but Café Provence on Blush Hill offers worthy sustenance far above what can be found in most similar hostelries. The original print version of this article was headlined "French Evolution"